Saturday October 4, 1969 NLCS Game #1- Atlanta Fulton County Stadium. It was a historic day for MLB, as today was the first NLCS Game played in baseball history. The NL Eastern Division Champion New York Mets, surprised everyone & became known as the Amazing Mets. Led by Manger; Gil Hodges the Mets won 1000 games (100-62). Their opponent was Lum Harris' Western Division Champion Atlanta Braves (93-69). The Braves featured Hall of Famers; Hank Aaron, Phil Neikro & Orlano Cepeda. It was a battle of the two teams ace pitchers & future Hall of Famers, as Atlanta’s 23 game winner Phil Niekro (23-13 / 2.56 ERA /193 Ks) went up against 1969 NL Cy Young winner Tom Seaver (25-7 / 2.21 ERA / 208 Ks). Both pitchers went past the 7th inning but they were't at their best. In the top of the 2nd, Art Shamsky singled & Ken Boswell drew a walk. Jerry Grote singled home to score Shamsky with the first run ever NLCS run. Next, Neikro’s knuckleball got passed Braves' catcher Bob Didier and Boswell scored making it 2-0. In the home 2nd, Rico Carty doubled & advanced on a Mets error. Clete Boyer hit a sac fly scoring Carty with Atlanta's first run. In the 3rd, the Braves took the lead after getting three consecutive doubles by Felix Millan, Tony Gonzales & Hanr Aaron. In the 4th, with two outs, Ed Kranepool singled & Jerry Grote walked. 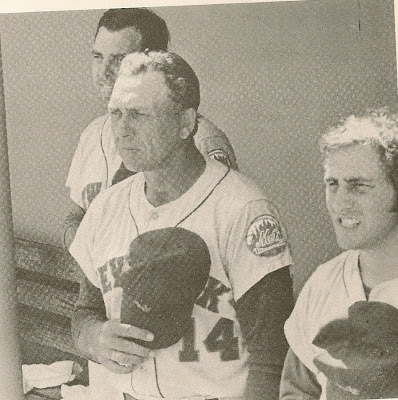 Bud Harrelson tripled to right field scoring Grote & Kranepool putting the Mets back in front 4-3. In the 5th. Atlanta's Tony Gonzales homered off Seaver to tie it back up. In the 7th inning Hank Aaron hit the first of his three Series HRs, putting the Braves ahead 5-4. In the top of the 8th, Wayne Garrett led off with a double to left field. Cleon Jones, who had hit .340 during the regular season, delivered with a base hit scoring Garrett to tie it back up at five. Art Shamsky, followed with a base hit, Jones went to second, then stole third base. Ken Boswell fielder’s choice scored Cleon Jones making it 6-5. 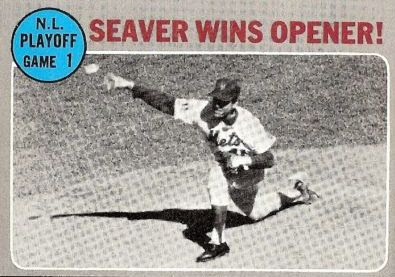 Neikro got the next two outs then walked Bud Harrelson intentionally to get to Seaver. Now with the bases loaded, manager; Gil Hodges decided to pulled Seaver in favor of pinch hitter J.C. Martin. 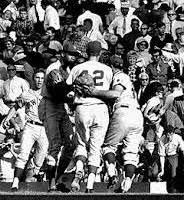 As usually was the case in the Amazing Miracle season of 1969, Hodges move once again prevailed. Martin singled to right field, all three runners would score on an error in the outfield. Mrtin would get thrown out at second but the Mets now had a 9-5 lead. It was all they would need, as Ron Taylor came on to close it out with two perfect innings, for the save. takThe New York Mets had a 1-0 Series lead.